“Power of Attorney” (1965) was an episode (Season 3, Episode 24) of The Alfred Hitchcock Hour (1962-65) TV anthology series. It was directed by Harvey Hart and scripted by James Bridges based on a story by well-known British mystery author Selwyn Jepson. Bridges is famous, in my mind, as the scriptwriter of the brilliant Alfred Hitchcock Hour episode “An Unlocked Window” (Season 3, Episode 17). 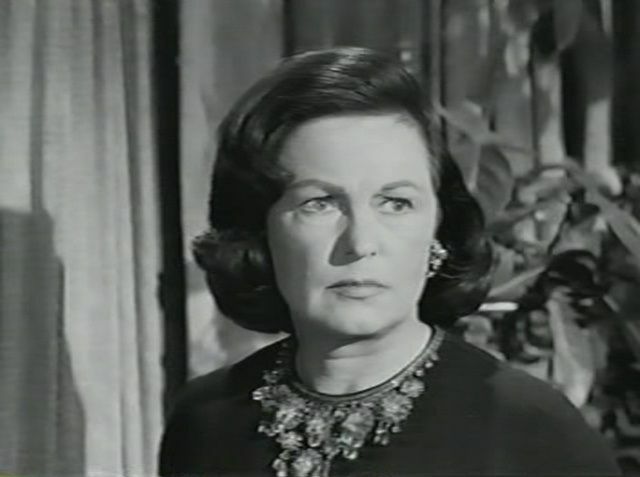 This episode here under discussion starred three veterans of stage and screen – Richard Johnson, Geraldine Fitzgerald, and Fay Bainter. The story concerns an unctuous swindler, Jarvis Smith (played by British stage veteran Richard Johnson), who preys on lonely older women who are charmed (or seduced) by his emotionally forthcoming and solicitous advances into believing him to be their dear friend. He poses as a financial investor who is investing his own money in promising selected ventures and urges his new woman companion to take advantage of his expertise and invest her own money, too. But of course it is all a scam, and the money soon disappears along with Jarvis Smith. In the opening sequence we see an example of how Smith operates, as he swindles a woman who thinks she is his beloved out of her savings and then vanishes. From the outset he evinces such an oily and phony manner that one would think his fraudulent nature would be evident to anyone he meets. This is a weakness of this episode, and the obviousness of Smith’s phoniness seems laughably artificial. Next Smith is shown introducing himself to two fellow airplane passengers seated across the aisle – the widow Mary Caulfield (Fay Bainter) and her spinster companion Agatha Tomlin (Geraldine Fitzgerald). Mary quickly succumbs to Smith’s entreaties for friendship, but Agatha is resolutely standoffish. 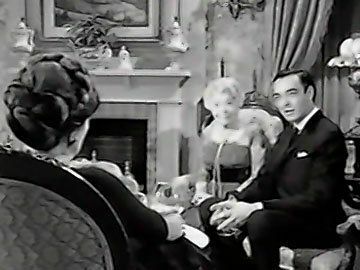 Smith soon sets his sights on seducing Agatha, and for much of the rest of the episode we see his strenuous (and persistently fake) efforts to insinuate himself into her affections. The viewer’s sympathies will clearly be on the side of Agatha’s skepticism, so it becomes disturbing when Agatha is shown slowly beginning to soften her resistance to Smith. Smith eventually does manage to swindle Mary out of her considerable life savings, and Agatha seems to be now of two minds about him. But it is not evident that Smith has broken any laws, so how can justice prevail? In the concluding scenes we see that Agatha was tougher and more mindful than we had been giving her credit for being. She comes up with a lawful way to exact her own “justice”. This episode, like many in this series, sets up a vain and reprehensible villain for the viewer, and tortuously winds its way towards a supposedly satisfying revenge. The pleasure you take in this will depend on your sensitivities on this score. The presentation is marred by Richard Johnson’s grossly over-the-top characterization of the slimy Jarvis Smith. But it does also feature the redeeming performance of Geraldine Fitzgerald as the continually pondering Agatha. She is the one who sustains our interest.